↑ 1.0 1.1 Erni, Rolf; Rossell, MD; Kisielowski, C; Dahmen, U (2009). "Atomic-Resolution Imaging with a Sub-50-pm Electron Probe". Physical Review Letters. 102 (9): 096101. Bibcode:2009PhRvL.102i6101E. doi:10.1103/PhysRevLett.102.096101. PMID 19392535. ↑ 4.0 4.1 4.2 Ruska, Ernst (1986). "Ernst Ruska Autobiography". Nobel Foundation. สืบค้นเมื่อ 2010-01-31. ↑ "James Hillier". Inventor of the Week: Archive. 2003-05-01. สืบค้นเมื่อ 2010-01-31. ↑ "The Scale of Things". Office of Basic Energy Sciences, U.S. Department of Energy. 2006-05-26. สืบค้นเมื่อ 2010-01-31. ↑ O'Keefe MA, Allard LF. "Sub-Ångstrom Electron Microscopy for Sub-Ångstrom Nano-Metrology" (pdf). Information Bridge: DOE Scientific and Technical Information – Sponsored by OSTI. สืบค้นเมื่อ 2010-01-31. ↑ McMullan D (1993). 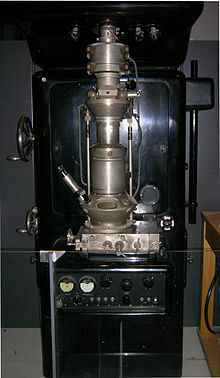 "Scanning Electron Microscopy, 1928–1965". 51st Annual Meeting of the Microscopy Society of America. Cincinnati, OH. สืบค้นเมื่อ 2010-01-31. ↑ Burgess, Jeremy (1987). Under the Microscope: A Hidden World Revealed. CUP Archive. p. 11. ISBN 0521399408. ↑ "Introduction to Electron Microscopy" (PDF). FEI Company. p. 15. สืบค้นเมื่อ 12 December 2012. ↑ Antonovsky, A. (1984). "The application of colour to sem imaging for increased definition". Micron and Microscopica Acta. 15 (2): 77–84. doi:10.1016/0739-6260(84)90005-4. ↑ Danilatos, G.D. (1986). "Colour micrographs for backscattered electron signals in the SEM". Scanning. 9 (3): 8–18. doi:10.1111/j.1365-2818.1986.tb04287.x. ↑ Danilatos, G.D. (1986). "Environmental scanning electron microscopy in colour". J. Microscopy. 142: 317–325. doi:10.1002/sca.4950080104. ↑ "SPLEEM". National Center for Electron Microscopy (NCEM). สืบค้นเมื่อ 2010-01-31. ↑ Luft, J.H. (1961). "Improvements in epoxy resin embedding methods". The Journal of biophysical and biochemical cytology. 9 (2). p. 409. PMC 2224998. PMID 13764136. ↑ Adrian, Marc; Dubochet, Jacques; Lepault, Jean; McDowall, Alasdair W. (1984). "Cryo-electron microscopy of viruses". Nature. 308 (5954): 32–36. Bibcode:1984Natur.308...32A. doi:10.1038/308032a0. PMID 6322001. ↑ Sabanay, I.; Arad, T.; Weiner, S.; Geiger, B. (1991). "Study of vitrified, unstained frozen tissue sections by cryoimmunoelectron microscopy". Journal of Cell Science. 100 (1): 227–236. PMID 1795028. ↑ Kasas, S.; Dumas, G.; Dietler, G.; Catsicas, S.; Adrian, M. (2003). "Vitrification of cryoelectron microscopy specimens revealed by high-speed photographic imaging". Journal of Microscopy. 211 (1): 48–53. doi:10.1046/j.1365-2818.2003.01193.x.